Framed within the stripes and blue field of an American flag, a young girl is pictured praying with her mother. 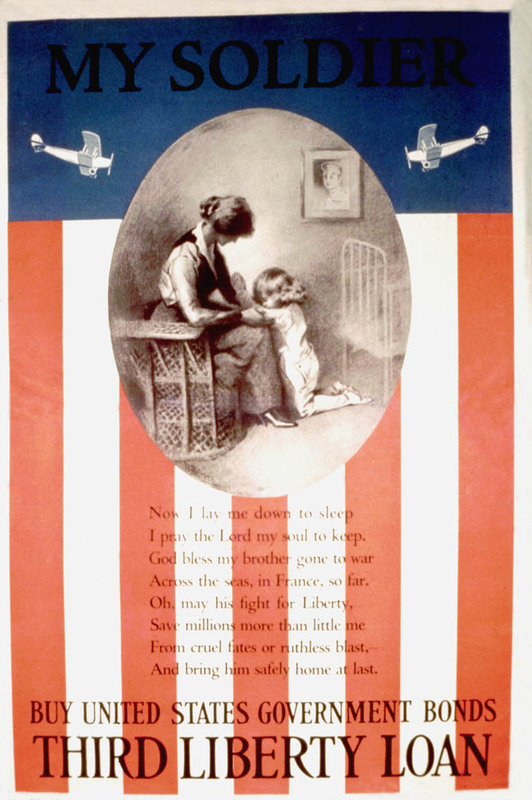 Poster Text: MY SOLDIER / NOW I LAY ME DOWN TO SLEEP / I PRAY THE LORD MY SOUL TO KEEP. / GOD BLESS MY BROTHER GONE TO WAR / ACROSS THE SEAS, IN FRANCE, SO FAR. / OH, MAY HIS FIGHT FOR LIBERTY, / SAVE MILLIONS MORE THAN LITTLE ME / FROM CRUEL FATES OR RUTHLESS BLAST,- / AND BRING HIM SAFELY HOME AT LAST. / BUY UNITED STATES GOVERNMENT BONDS / THIRD LIBERT LOAN.